Cecil is only a sketch, but he has a name and he wonders if, just maybe, he might be destined for greater things. Cecil is the readers' eyes as we see books created in front of us. Cecil’s imagination soars, and then one day he does land in a book–and a new, exciting, even dangerous, adventure begins. Created using a magical collage of photography, sketches, lino cuts and objects, this is Narelle Oliver's last book and some of her finest work. I adore Narelle Oliver’s illustrative style. I have previously reviewed Sand Swimmers and Rock Pool Secrets. The art work in I Want to Be in a Book is created from collage. Oliver has used photography, linocut, sketches, bits and pieces like pencil shavings, paintbrushes, and paper scraps to help us imagine the chaos and colour that is an artist and writer’s studio. It makes for a visual feast. Even the cover is special - Cecil’s wings have a special textural gloss, and the dotted lines, paper scraps and vibrant title backgrounds hint of the fun that’s inside the book. There are so many reasons for schools to purchase I Want to Be in a Book! Literature-lovers will will scoop it up on the bitter-sweet realisation that it is the last book Narelle Oliver worked on. Teachers and parents will love the way the book encourages kids to create their own Story Ideas book, one that perhaps shares the features of an artist’s journal. I can certainly see children using their own sketches and bits and pieces to set up scenes to photograph that illustrate their own work spaces, even if that space includes banana peels and toys! 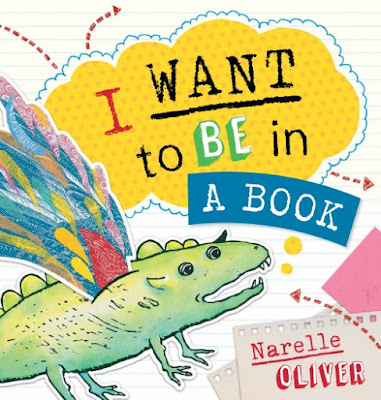 As well as making a wonderful model for kids’ own imagination and writing, I Want to Be in a Book is a lovely story. Oliver’s writing is heart-warming - from the moment we read that “He (Cecil) thought he might be a little bit special.” we are right there with Cecil, seeing his home, dreaming his dreams, and then being whisked away on magical adventures. I Want to Be in a Book is going straight onto my Favourite Children’s Picture Books of 2017 list. I am also awarding it the coveted Book Chook Feather of Approval, and predict that many more awards will follow. Love the Book Chook Feather of Approval! And a very fitting recipient. Maybe not a famous award yet, but an enthusiastic one! It's such a great book - and on that list of books about books that I am compiling!